Use morning, noon and night for breakfast sausage, kid's meals such as grilled cheese sandwiches and hot dogs and in the evening for tasty burger, fish, chicken and steak dinners. Try a fresh dessert like grilled pineapple too! Unique, innovative, natural Dura Ceramic non-stick ceramic coating is PFOA and PTFE free and lasts 4 times longer than traditional non-stick surfaces. It's scratch resistant and won't flake or peel. Food cooks up to 20% faster than ordinary non-stick surfaces, saving you time and energy and it's super easy to clean. It's so simple - just set the timer and push start. Your foods will grill up deliciously with just one touch. 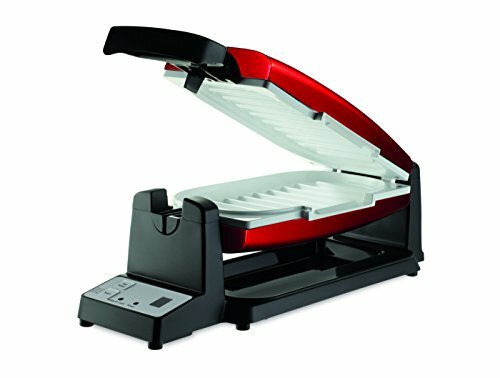 Along with cooking convenience, the ingenious design flips vertically to drain juices during grilling. Then removable drip tray can be placed in the dishwasher for easy clean up. Cook virtually anything in 7 minutes or less! From breakfast sausage to burgers, grilled cheese to steak and chicken. ..even dessert!